Our porcelain crowns and bridges are designed to strengthen and rehabilitate your smile. Appropriate for damaged and missing teeth or for dental implants, each restoration is handcrafted to return your oral health and function back to optimal levels. Custom Dental Crowns: A crown is a full-coverage restoration that we use to place over teeth affected by large cavities, recent endodontic treatment, severe fractures or single implant placement. 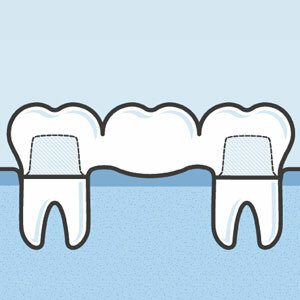 Multi-Tooth Dental Bridges: Like the name suggests, a bridge spans from one tooth to the next. We use them to replace missing teeth when there are healthy ones on either side of the open space. Implant supported bridges can replace more teeth at one time, in lieu of wearing a removable partial appliance. Most crown and bridge procedures require two visits to complete. The first appointment is for preparing the supporting teeth and taking an impression, which our lab uses to craft the fixed restoration. About two weeks later, the permanent crown or bridge is ready to bond in place. This second appointment is relatively quick and can usually be completed without any anaesthesia. Repairing damaged or missing teeth doesn’t mean you have to sacrifice the appearance of your smile. We use high quality ceramics to reconstruct your bite for aesthetic and functional results. Each crown or bridge is matched to the shade of its neighbouring tooth, for the most realistic results. A common misconception about dental treatment is that it can be delayed if the affected tooth doesn’t hurt. Unfortunately, cracked or decaying teeth can break apart at a moment’s notice. It’s best to repair damaged tooth structures before the situation becomes more severe and costly to repair. We make it a goal to not recommend treatment unless it is absolutely necessary. Schedule an exam today to find out if a crown or bridge can help you return your smile back to its optimal level of health!